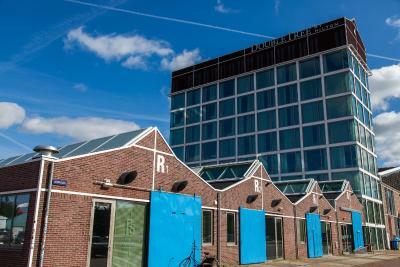 Lock in a great price for DoubleTree by Hilton Hotel Amsterdam - NDSM Wharf – rated 8.4 by recent guests! Everything was so pristine. The staff was lovely. The price was modest. The location was great for us to get to transportation to the whole city. its in NDSM, very urband and Young and cool areas. close to a lot of cool places to have a coffe and so. and also the hotel is nice. bed comfgort have very nice breakfast and also, staff are very friendly. Gooe stay. Exceptional service from Masha at the front desk. Thank you! Location. Location. Location. Restaurant Brooklyn has nice hamburgers. And praise for Devi from the staff! The property was a lot as described in booking.com , however You should be prepared that apartments are rather small. Enough place for one, but no more. Wi-Fi was fast. 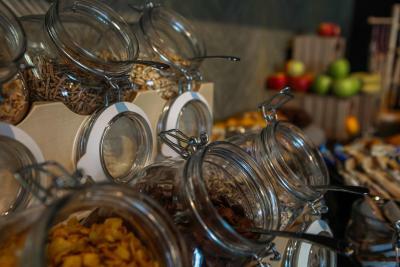 For the breakfast there was a good range to choose from, all nice and fresh. All personal very pleasant. Especially housekeeping when I approached my room to move in. Nice friendly young man. 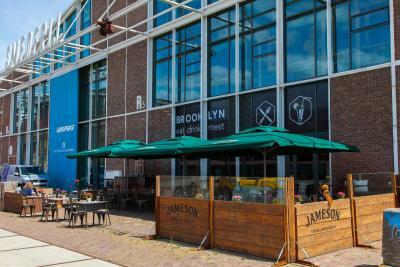 DoubleTree by Hilton Hotel Amsterdam - NDSM Wharf This rating is a reflection of how the property compares to the industry standard when it comes to price, facilities and services available. It's based on a self-evaluation by the property. Use this rating to help choose your stay! 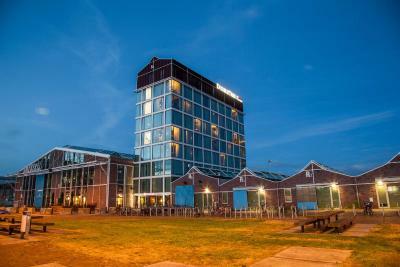 DoubleTree by Hilton Hotel Amsterdam - NDSM Wharf is located in Amsterdam North, right across the waters of canal IJ. 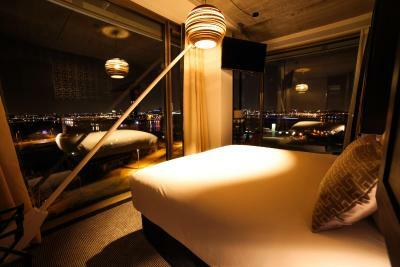 This 4-star boutique hotel offers modern accommodations with waterfront or NDSM Wharf view. Some rooms have street art interior. Each room will provide you with air conditioning, a LED TV, a mini-bar, ironing facilities, a Nespresso coffee machine and tea making facilities. The bathroom is fitted with a walk-in rain shower and bathrobes, bathroom amenities and slippers are provided. Free Wi-Fi access is available. 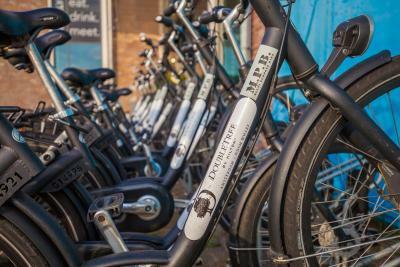 DoubleTree by Hilton Hotel Amsterdam - NDSM Wharf is only 10-minute ferry ride from the Central Station. Dam square is 15-minute drive from the hotel. NSDM dock is known for its cultural activities. The area is a great choice for travelers interested in festivals, events, street art museum and city walks. When would you like to stay at DoubleTree by Hilton Hotel Amsterdam - NDSM Wharf? This twin room features a tea/coffee maker, bathrobe and cable TV. This room has a queen size bed and over looking the view of Amsterdam marina. This double room comes with air conditioning, flat-screen TV and soundproofing. This single room has a electric kettle, cable TV and tea/coffee maker. This single room has air conditioning, satellite TV and tea/coffee maker. This double room features a bathrobe, electric kettle and tea/coffee maker. 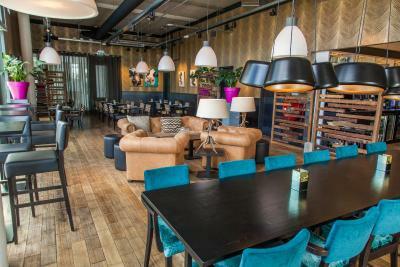 Uniquely situated in the authentically rough and creatively colorful landscape of the NDSM-werf, DoubleTree by Hilton Hotel Amsterdam - NDSM Wharf is a stylish boutique hotel that gives a completely new meaning to your visit in Amsterdam. 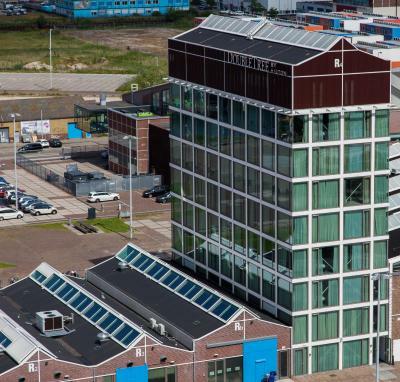 Our unique and quiet waterside location, with convenient access to Amsterdam Central Station is just one of many reasons making the hotel a very exciting and worthwhile place to visit. 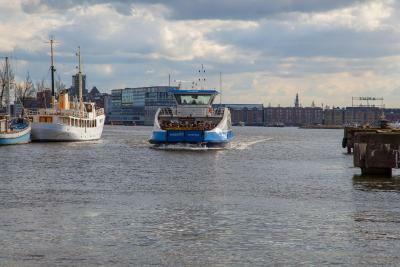 There is a complimentary ferry runs between the hotel and the city center every day. Amsterdam Schiphol Airport is just a 20-minute drive away. 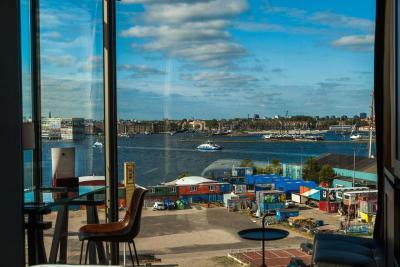 Enjoy magnificent view of Amsterdam marina from one of our waterfront view rooms. All guest rooms offer air-conditioning, with FREE WiFi, an LED TV, a plush bed, and a walk-in rain shower. Our Deluxe and Superior rooms offer more space and amenities Along with 24-hour business center, the flexible 120 sq. m. meeting room is equipped with the latest A/V technology. 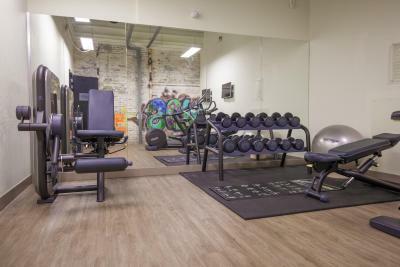 On-site parking is available for a fee, complimentary access to 24-hour fitness center. 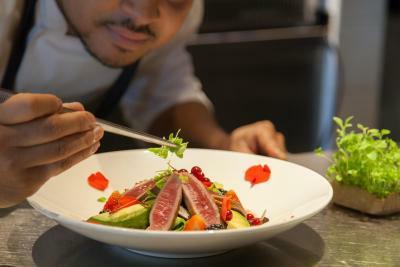 Enjoy delicious Dutch and international cuisine at the 'Restaurant Brooklyn'. 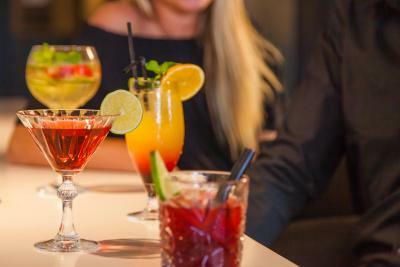 Sip a cold glass of house special Brooklyn beer or a signature cocktail at the Brooklyn Bar. 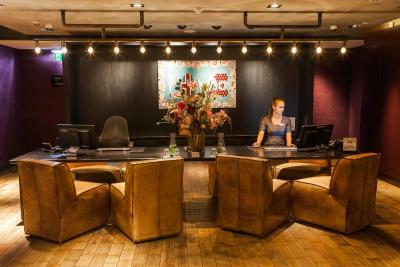 House Rules DoubleTree by Hilton Hotel Amsterdam - NDSM Wharf takes special requests – add in the next step! 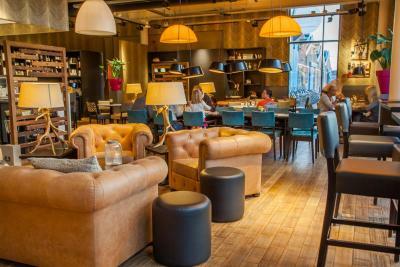 ATM card DoubleTree by Hilton Hotel Amsterdam - NDSM Wharf accepts these cards and reserves the right to temporarily hold an amount prior to arrival. 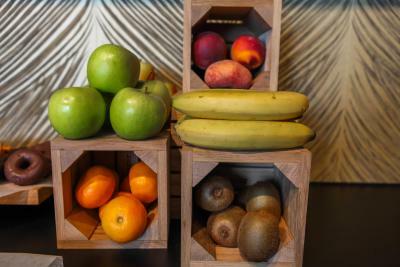 DoubleTree by Hilton Hotel Amsterdam - NDSM Wharf accepts these cards and reserves the right to temporarily hold an amount prior to arrival. 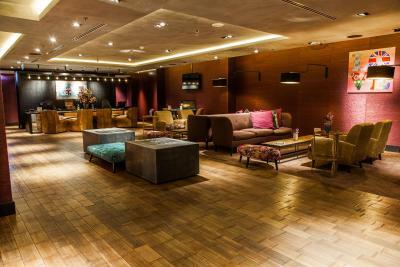 Please note that for all reservations, a deposit of EUR 100 per room will be charged on the day of arrival. This deposit is refundable and subject to a damage inspection. TV at a funny angle. The river view and the great service. The area around the hotel made it a little awkward to walk to the hotel from the ferry. It was quite expensive for what it was but nevertheless it was a good hotel. Good location for the Marina and Central Rail/Metro station. Staff very friendly and efficient. Facilities were good and the rooms were clean and a reasonable size. The rooms were incredibly noisy. The wind noise was unreal even with all windows shut, and noise from neighbouring rooms was loud and unexpected from a hotel such as the Hilton. Beds a littler firmer than we are used to. Great location and price to be near Amsterdam city centre - only a 10/15 minute free boat journey away. Well finished and clean hotel. Plus a delicious welcome cookie when you check in! The room was slightly worn, wallpaper marked, chair leather stained and furniture chipped, but over all a good room with very good facilities. Amazing view, very comfortable, lovely staff! Front reception needs refurbishing- staff were friendly enough. The area is run down and doesn’t look good coming to the hotel. Extremely industrial looking. For the price I was disappointed!! Clean enough, surrounding area was a shock!! It seems not easy to understand the temperature control in the room. A nice welcome and the location is very near from the ferry station. Not a dislike but be mindful rooms are a little small so if you like lots of space may not be ideal. I had a Queen room fine for just me and maybe another. Hotel in a lovely location, easy to travel too by getting the Ferry straight from Amsterdam central. In a quirky location with a few restaurants and some interesting art pieces on a different side of Amsterdam away from the hustle and bustle.